The Robotics Club is a project-based club that involves students working in teams to program and build a LEGO Mindstorms robot for use in competition at the annual RoboRAVE event held in Albuquerque. The RoboRAVE International was founded by three New Mexico teachers including the founder and President of Inquiry Facilitators, Inc. Inquiry Facilitators, Inc. was established in 2002 as an educational non-profit in New Mexico. The mission of RoboRAVE is “Making Research A Core Value,” with the belief that through robotics our kids are learning how to question, run multiple investigations, build connections, and engage in endless discussions that allow them to reflect on their own impact. 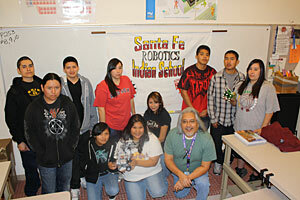 The SFIS Robotics club is open to any student, grades 7-12, who desire a challenging experience. The faculty advisor for the Club is Smokey Trujillo, who is also an original founding member of the RoboRAVE. For more information on RoboRAVE, please see http://www.roborave.org/ or contact the faculty advisor.